The Scottish deerhound is an athletic, affectionate and loyal dog breed. Among the tallest of all breeds, the deerhound is long and lean with a physique much like that of a greyhound. The breed is known as the "Royal Dog of Scotland" and was once described by Sir Walter Scott as "the most perfect creature of Heaven." Deerhound enthusiasts can tell you how rewarding it is to have one of these dogs. With their playfulness and gentle dispositions, they make delightful companions and can be a great family pet. The Scottish deerhound is a native of Scotland and can be traced back to the 16th century. The breed is believed to have existed prior to the 16th century but went by a variety of different names, including the Irish wolf dog, Scotch greyhound, rough greyhound, and Highland Deerhound. Ultimately, the breed was named for its skillful ability to hunt deer. The Scottish deerhound has been highly valued for its skill and beauty. In fact, during the Age of Chivalry, no one of rank lower than an earl was permitted to possess a deerhound. Despite its value, the breed faced near-extinction in the mid to late 18th century—with the collapse of the Scottish nobility after the battle of Culloden and the Jacobite rebellion—but was saved by enthusiasts Archibald and Duncan McNeill. They also became rare again after World War I due to the breakup of large estates. The Scottish deerhound arrived in the U.S. towards the end of the 19th century and was admitted to the American Kennel Club (AKC) Hound group in 1886. Today, the deerhound remains a relatively rare breed of high value. The Scottish deerhound has a harsh and wiry coat that is 3 to 4 inches long and requires only basic grooming. A weekly once-over with a slicker brush and/or comb should be sufficient to keep the deerhound's coat looking its best. The breed sheds at a fairly low rate, and even less with regular brushing. Your deerhound should only need occasional bathing as necessary based on odor or a dirty coat. Though Scottish deerhounds are excellent athletes, they can also become lazy as adults. They love to run and play outdoors but might loaf around when indoors. However, daily exercise is essential in order to keep your deerhound motivated and fit. You will need to walk your deerhound on a leash as this breed will chase anything that moves. This can also be a challenge as they will bolt when on a leash and could yank you off your feet due to their size. Children should not walk this breed on a leash as they will not be able to control such episodes. Proper training and socialization are important for deerhounds. Fortunately, they tend to learn well. This is an intelligent breed but often has a short attention span. In training, it is important to discover what motivates your deerhound, as this can be a challenge for some. Like other sighthounds, the deerhound is easily stimulated by visual prey and tends to have a high prey drive. Cats and other small animals may provoke their predatory instinct until they learn the animal is a family member. Raising your deerhound around small pets can help teach the dog that they are not prey. However, you might never feel comfortable leaving your deerhound unsupervised around small pets. They enjoy the company of other large dogs, especially another deerhound. Scottish Deerhounds are very loyal and extremely affectionate with their families and typically prefer not to be left alone. They are rarely aggressive and respond well to strangers. This is definitely not a guard dog. Most deerhounds will do well with children when properly socialized, but as a large dog, they should not be left unsupervised around small children. Deerhounds are quiet and lazy inside, but they are not well-suited to apartment living as they need a yard and room to roam daily. Yards need to be securely fenced as they will try to pursue anything moving outside the fence. Electronic fences will not stop them. As with other sighthounds, this breed is sensitive to anesthesia and cannot be given the regular dose. Be sure to discuss this with your veterinarian before any treatments requiring anesthesia. They are also prone to dilated cardiomyopathy, an enlarged heart that leads to abnormal rhythms and heart failure. Deerhounds need about 3 to 4 cups of dry food each day, which should be divided into two meals. They are prone to bloating and if they gulp their food or eat too much at one time, they risk this condition. When a bloated stomach becomes twisted, it is a medical emergency. Monitor your dog's weight to prevent obesity. A dog's needs will change as he ages and you should discuss appropriate feeding schedules, amount of food, type of food, and exercise with your veterinarian. The Scottish deerhound is a relatively rare breed, so locating a puppy or rescue may take some time. 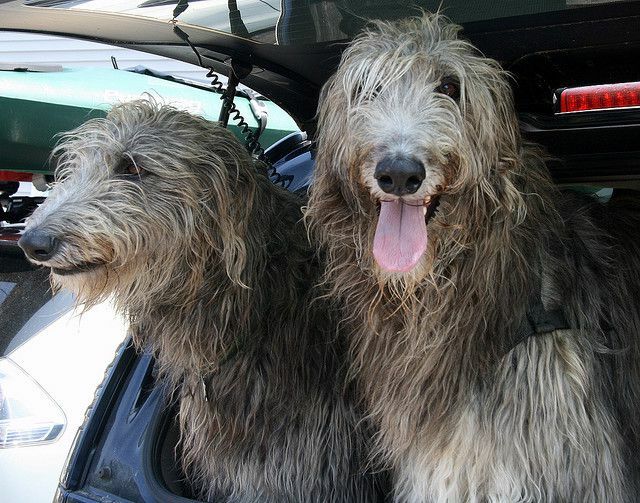 The Scottish Deerhound Club of America offers information about rescues and placement, as well as maintains lists of reputable breeders throughout the U.S. and Canada. Another source for breeders is the AKC Marketplace. Before you decide whether a Scottish deerhound is right for you, be sure to do plenty of research. Talk to other Scottish deerhound owners, reputable breeders, and rescue groups to learn more. If you’re interested in similar breeds, look to these to compare pros and cons. There are many dog breeds to explore. With a little research, you can find the right one to bring home.